REC TEC Bullseye Review - Performance, Design, Warranty etc. While REC TEC offers a lot of premium, high-end grills, packed with technology and fancy features, they decided to go for the classic way on their Bullseye model. The REC TEC Bullseye is a combination of a gas and a charcoal grill into one unit, stripped away from the technological features but still having quality craftsmanship, durable construction, and cooking performance. I have prepared a full guide with my personal REC TEC Bullseye Review, customer reviews, deep insights of the features, warranty, support and brand history. If you like to read a full review before going for a purchase, just like me, then you will definitely find everything you need to know about this model in one single article. Note: To jump into the conclusion, you can use the quick navigation table of contents below or just click here instead. 10.1 Can I leave the Bullseye model outside? 10.2 How often should I clean my grill? 10.3 Are the REC TEC cooking grates dishwasher safe? 10.4 What is the lowest temperature Bullseye can cook? First of all, before digging into the review, let’s talk about the benefits of owning a grill which offers you both the convenience of using gas and the unique flavor of charcoal. These models are becoming more and more popular, thanks to efficiency and performance that comes from combining gas with charcoal. You don’t have to worry about lighting charcoal using external lighters or fluids. Most of these models have a push of a button startup and they use the gas power to light up the charcoal pellets. Another benefit of owning these models is that you save space. A lot of people I know, have two separate grills because they use the gas model frequently when they need to cook a quick steak but still want to use the charcoal model during the weekends to relax and enjoy the unique wood flavor. Picking a similar model will save you space as you don’t have to keep two units but you have both combined into one. Also, another advantage of these models is that they don’t require a lot of cleaning. Most of these combo grills are produced in the last years, so the innovative design has made possible for fuel to not create much ash and the little bit of ash that is created, can be easily deposited and cleaned using the built-in cleaning system. The REC TEC Grills was founded in Augusta, Georgia in 2009, by two best friends, Ray Carnes, and Ron Cundy. They decided to commit and build a high-quality grill which sells at a reasonable price. They wanted a grill product which has the same temperature control as an indoor oven, so they developed the Smart Grill Technology system. Later on, they decided to not just convert the gas into heat but to conquer the flavor of charcoal too. They calibrated their Smart Grill Technology to not just use gas as fuel but to produce accurate cooking temperatures & flavor when using premium wood pellets too. On top of that, they wanted their product to last a lifetime, so they decided to go for a heavy gauge stainless steel material which not only makes the product look good but offers durability for years. Year after year, they follow the direct-to-consumer approach, which gives them the difference over competitors by produce high-quality products with credibility and keeping them at a reasonable price. If you are looking for a new barbecue grill, then REC TEC Bullseye is one product worth considering. 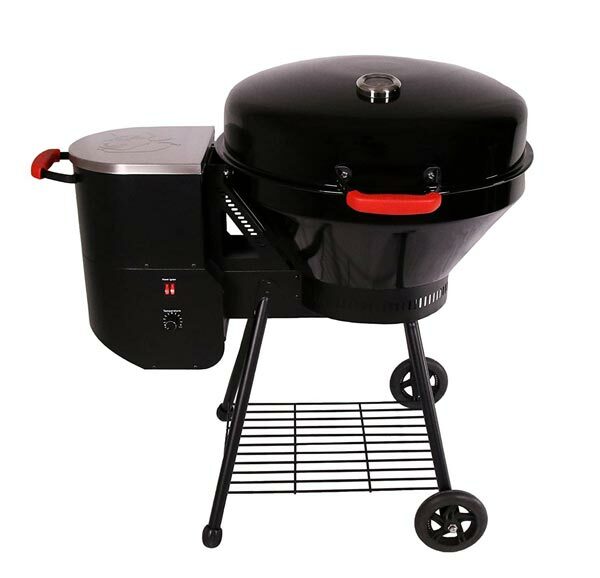 It is a modern, stylish looking grill, which offers you the convenience of cooking with gas and the unique flavor of charcoal at the same time. It features durable construction, lots of cooking space, great performance and features which make this model really useful and easy to use. Its compact design and functionality make this model suitable for grilling hamburgers, hot dogs, steaks, etc, a perfect option for a small-to-medium size family. The one thing which I like most about this model is the wood pellet and gas combination. You get the convenience of a gas grill but with the uniquely delicious flavor of charcoal. This model, in fact, uses wood pellets as fuel to give you that smokey flavor but it uses its ignition system to light them using gas, just like any other propane powered bbq. As you may already know, cooking with pellets is very easy and you just have to set up the temperature and the setting and watch the grill do its job. Also, wood pellets are much easier to clean after use as they don’t produce a lot of ash, which is very helpful for a lot of people as everyone hates cleaning after having a nice steak. Now, the REC TEC Bullseye is not meant for massive parties or large family groups. It is a compact size grill, suitable for cooking food for up to 7 people. Overall, it has about 380 square inches of cooking space, which are more than enough to fit up to 25 full hamburgers. The cooking grate is porcelain coated, which has the ability to leave some perfect sear marks on your steak and will also be very easy to clean after you finish cooking. On top of the steel fire pot, you can find a durable, stamped flame deflector plate, which will ensure the heat will distribute evenly across the cooking surface, to provide a great smoking performance. Under the lid, you will find the HotFlash Ceramic Ignition System. This electronically fired ignition system will make sure that your grill lights up every time you want to, so you will never need to buy any lighter fluid again. And what is cool about this model is that it allows you to continue cooking even when you leave the 22-inch lid open. So, you don’t have to worry if the fan and burner are off while you take a look at what you are cooking. The total dimensions of this unit are 22 x 38 x 36 inches, which are at the middle point of getting the job done and small enough to be considered a compact and portable size grill. The hopper can take up to 15 lb of wood pellets in one run so there will be no need to refill during cooking sessions. You can even consider this unit as an add on to your built-in grill, in case you don’t always want to fire up the larger unit which takes longer to pre-heat and uses more fuel than a smaller one. It has a 200 - 550°F temperature range which is enough to cook almost everything, from chicken, steak, brisket, etc. The built-in ignition and fan are powered by a 110-volt cord so you may want to prepare the place near an electrical outlet. When you first look at the Bullseye, you will quickly notice its sleek and stylish design. The exterior of this model is finished in a robust baked porcelain enamel material, which combined with the oval shapes, makes this unit very modern and good looking. After each use, you don’t have to worry about doing a deep cleaning of the exterior as you will make it shine again with just one wipe, thanks to its shiny porcelain enamel finish. And besides the good looking, this finish is extremely resistant to thermal stress, weather condition, chipping, cracking, etc although protecting it, especially when a storm is coming outside, is always a good idea. The inside side of the cooking chamber is also made of porcelain enamel coated, which not only increases the durability of the unit but also helps it to retain the heat much better than other materials, for an effective and efficient solution. If you want to store some utensils, you can always use the little storage tray below the cooking chamber, so you don’t have to go inside your house every time you need something. The Smart Grill Technology built into REC TEC Bullseye gives you the ability to have total control over the temperature of the unit. You can start the grill by using the user-friendly controller to set up the temperature, which is pretty cool for a wood pellet bbq. The temperature range varies anywhere between 200 to 550 degrees Fahrenheit, so it totally depends on you whether you want to go for a low and slow cook or high and fast cooking. The HotFlash ceramic ignition system makes the startup lighting fast, allowing the Bullseye to reach a temperature up to 400 degrees Fahrenheit in just 10 minutes. And to have an eye on the cooking temperature, the REC TEC has included a built-in lid thermometer, so you don’t put the food on the grill without it reaching the optimal cooking temperature. When you pick a pellet grill, you may want to consider the hopper size and its burning speed. You don’t want a model which you will need to refill two-three times during a cooking session. The REC TEC Bullseye has a 15-pound hopper, which is more than enough for 15 hours of cooking time. And if that doesn’t sound enough to you, then its automatic pellet feeding system will throw pellets anytime it is needed to reach the desired temperature. When pellets start to run out, you simply open the lid of the hopper and pour in more pellets. One cool feature that I like from its pellet system is the Automatic pellet auger and the hopper’s secure latching system, which make sure that the pellets stay where they need to be and they don’t get inside the firebox when they shouldn’t. The efficiency and the burning speed is also controlled by the air circulation fan which contributes and directs the airflow to supply oxygen and maintain precise cooking temperatures. The Smart Grill Technology developed from REC TEC, which will allow you to cook at different ranges of temperatures and the built-in removable flame deflector plate, give this grill the ability to cook almost everything. You can choose to smoke a brisket, sear a steak, or grill a tender chicken breast without using different devices. Also, the combination of the 15 lb hopper capacity with the heat fans and cooking system, will allow this grill to keep and maintain a 200°F temperature for a whole day of cooking. This is pretty useful especially if you like to smoke huge chunks of meats, such as chuck roast or whole turkeys. The REC TEC Bullseye is a compactly designed grill. Its total dimensions are 22 x 38 x 36 inches, which is the perfect size to get things done and not take a lot of space in your backyard. With it weighing just about 55 pounds, it is one of the lightest REC TEC models and maybe one of their most suitable ones to be considered as a portable grill. It even features heat resistant handles and two fixed rubber wheels, which will make this grill very easy to move around. One thing which can be pretty annoying for a lot of people is that this unit comes fully disassembled. There is a detailed instruction manual on how to get everything together but a lot of people just hate assembling things. Assembly is often required to almost every grill model in the market, not only this one. This is due to their size and construction, so there is nothing you can do about it unless you go for a small, portable grill. As for warranty, this unit comes with a 1-year warranty. This warranty covers all components, except for external attachments or damage caused by corrosion. One thing that I liked about REC TEC was their customer support. They have a responsive customer service line, which will answer and give you a solution for any problem you may have. One thing which I think is a drawback is that the heating dial control doesn’t have the exact temperatures listed. There is no marked number in the dial, so you kind of have to guess the temperature when you set although it isn’t very hard to set the desired temperature once you get a feel for the controls. You just have to in mind that the lowest settings is going to heat up to 200°F and the max settings will heat up the grill up to 560°F. If you want a 400-450°F temperature, you can leave the dial around the middle. Also, the quality of your pellets will affect the amount of heat, so if you want the best results, dry, fresh 100% hardwood pellets are recommended. There is an included manual in the package which gives you detailed instructions on the temperature your Bullseye grill will achieve under different circumstances. After we reviewed the REC TEC Bullseye model based on construction, performance, features, warranty and support, we think that it is a pretty decent model and one of the best bbq for its category. Although it is slightly more expensive than the other competitors on its category, the convenience of the gas powered ignition, combined with the charcoal flavor, temperature control and modern look, makes this model a very good option. If you are looking for a more traditional combo model, you may want to check our other article on smoker grill combos. Can I leave the Bullseye model outside? Yes, you can leave your REC TEC Bullseye outside. The most recommended solution would be to keep it in a safe place, where weather conditions don't have a huge impact on the unit and preferably covered. This way, you will extend the life of your grill. I would recommend to do a quick cleaning after each grilling session, especially if sauces, marinades or grease is spilled all over your grate. Are the REC TEC cooking grates dishwasher safe? Yes, the REC TEC grates are dishwasher safe, so you can go and put them in the dishwasher without any worries. What is the lowest temperature Bullseye can cook? The Smart Grill Technology gives the Bullseye the ability to cook at a very low temperature, 200°F to be exact.